Page 8 of 8 Ask Protential About Tournaments Register or Use the arrow to the right to read the other 7 page(s). How do you play example in a tourney around 1k players before reaching the ITM, you're low stack max 10BB and 20-30 players should relegate for reaching money??? What do you do with small pairs example? or AJ AQs cards? I play live tournaments pretty well in my opinion. What is your best advice for playing in online tournaments as clearly there are some different things to consider. hi Ryan would like to know which tournament format is best and what are the values for who is starting and has a low bankrrol? Low stakes sngs or cash, or small field tourneys. If you have 100$ or less stick the the $1 games. Depends on position. This short we can still generally jam fairly loose. Really tighten up when 10 or less away tho. Online is mostly about having great fundamentals and understanding general adjustments. Have you ever played Sit and go hyper 6max or similar actively? Hi Ryan hope your awesome! is this normal or common? could you give me an advice how to improve my game? I play low stake live tournaments often. Starting stack is low, blinds fast. For example, 10k starting stack blinds start 25/50, 15 min levels. what should you do in a tourney with 2 hour late reg time and unlimited rebuy? I've not played many hypers, but I believe RaiseYourEdge and upswing should have some SNG content, otherwise RunItOnce will. Pretty typical, large field tourney are very hard to final table. Study lots and focus on working hard on your game and play lots of volume. Hard work + volume = Results. Fast structure can be frustrating due to this. Can't be overly tight in turbos and expect to do well. I suggest getting snapshove and studying with training sites so you are more comfortable with under 30bb. The looser people play the easier it is to build a stack. Just gotta play patiently and play your big hands hard and fast. I took a shove spot that I am unsure of. Here is the prize info. 37 left, 27 pay, and I was around 12/37 with 25bbs. Villain was running 29/28 with RFI 38 and STL 100 over 42 hands. He'd been 3-bet once before and folded. Also, I'd seen him open AJo UTG a few levels ago. I ran the hand in ICMizer and got this result. Looks like I may have lost 6 to 12 dollars on the shove depending on his opening range. This was at the 1250/2500 level and the bubble broke 4 levels or 40 minutes later at 3000/6000 with an average stack of around 60K. I could have probably folded into the money with a half average stack of around 5 bbs if I did not win another hand. For this reason, I think I should have folded 88, but would you also fold hands like TT and AQo? Also, I am assuming I should be folding or shoving range here. Is that correct? Stay away from rebuys/etc as they are really 5/6x the buyin, unless you are rolled for that. Proper roll for a normal tourney = 200+++ buyins. Many more if you are grinding full time. I jam this, but I agree it is close and only a jam vs loose opponents. Ask me anything tournament poker related that doesnt involve a specific hand! Topics like: Theory questions, studying questions, mindset, game selection, bankroll management, staking industry, sites to play on, software and tools, etc. If you'd like my input on a handhistory please post it in the designated area of the site and I'll happily give my input! Hi Ryan. How would you aproach Hyper tournaments??? Learn shove ranges using SnapShove and learn proper ICM with icmizer and Holdem resources. really sorry for disturbing you firstly. i have some questions if you help me i would be really apprciated in your free time. do you play cash games or tournamants more in your carreer? do you think to play regularly live tournaments in vegas or is it too costly? do you play online or live more? do you think online cash games are not profitable because of gto? I play 98% tournaments, done so almost my entire 10 year career. 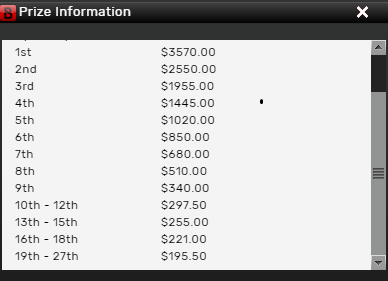 Most of what I do these days is play live tournaments in Vegas (from $400 to $10,000). I play some online, but usually just sundays. Online cash games can be profitable, just have to game select very very carefully. How to manage stack sizes?